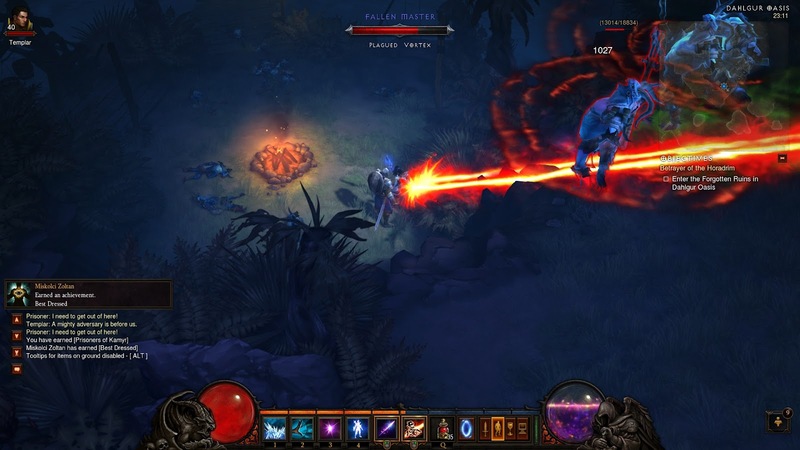 Yes, Diablo 3 has been out for a couple of weeks now. And it has been unplayable also for quite some time. Warning, spoilers! 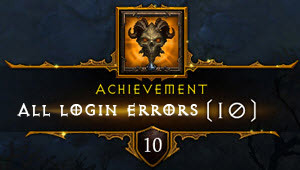 Yes, I was one of those who pre-ordered Diablo 3 and waited for the overwhelmed servers to start grinding the queues. 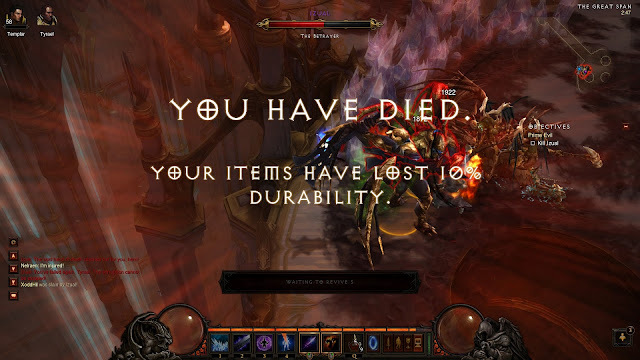 After a couple hours, I could finally get in, and killed Diablo on normal the very first day. Then lost the achievement for doing so. This seems to be an unfortunately recurring theme with the game: problems. Not crashes, but mainly service and design problems. But let's talk first about the game(play) itself, without the whole off-again-on-again experience! 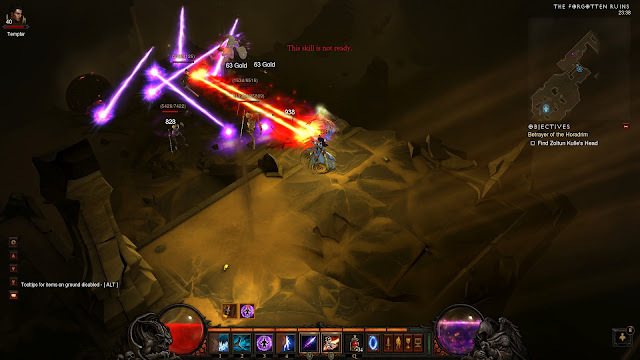 The game itself is entertaining, very much so, and some of the changes are quite welcome compared to Diablo 2, while others are definitely not. Graphics-wise, Diablo 3 is quite nice. No, you still can't spin the camera around, but you can zoom in close onto the character to show off the clothes. Ruins crumble nicely, though unfortunately you can't destroy everything in your way. I.e. : parts of the stone railing are always indestructible and so on. Effects are nice, but you might just get caught up in too much and not notice that you should be running away until it is too late. 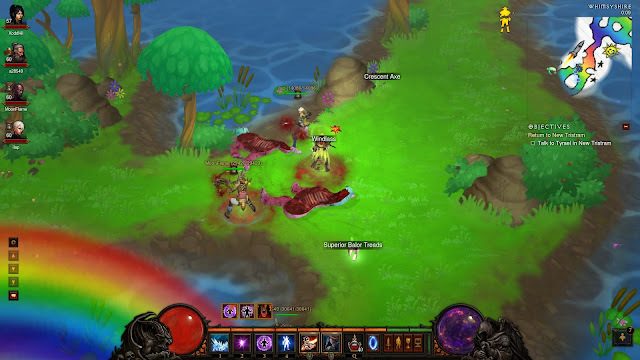 I've not experienced any graphical artefacts or slowdowns except while fighting/killing literally dozens of mobs at once. The cinematics are hit-or-miss. There are the regular CGi movies between the acts that are of the regular Blizzard quality, but between the missions, you will only get some 2D drawings waving in the wind, which looks quite cheap compared to the big ones. My big gripe is that the videos are 720p only and do have some noticeable artifacting, but I'd guess most players won't even notice this. Fun fact: if you decided you don't like the "colorful" graphics and want a more moody, darker look, and would like to use a MOD, don't. Modding will get you banned, regardless of what you mod. So long, full conversions and all other mods of Diablo 2! It was nice to know you. Well, I can't comment on the whole game, on the account of playing mostly with voice chat and thus a very quiet game. Music is very generic and nowhere near the quality of the old Tristram tune unfortunately. The only piece I do remember is the one the installer plays, but even that is topped by the older Tristram tune by a mile. 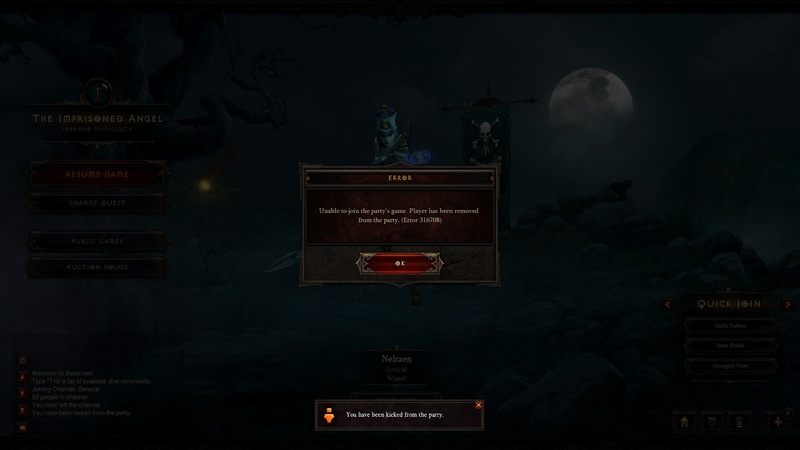 It is very revealing when the Diablo 3 Behind the Scenes blu-ray background music is, in many cases from Diablo 2. Voice acting is OK, conversations are mostly well written, though sometimes the followers' replies seems to have absolutely no correlation to what the character just said. 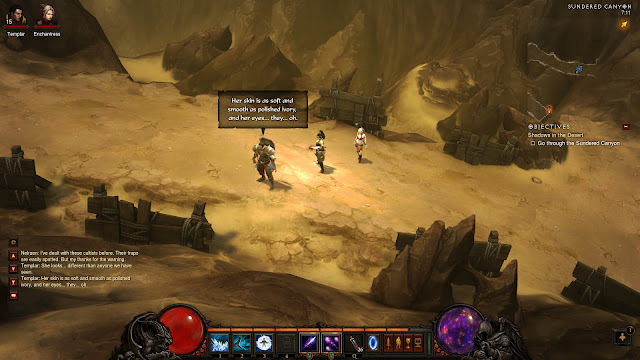 One of the defining features of past Diablo games was the randomly generated terrain. 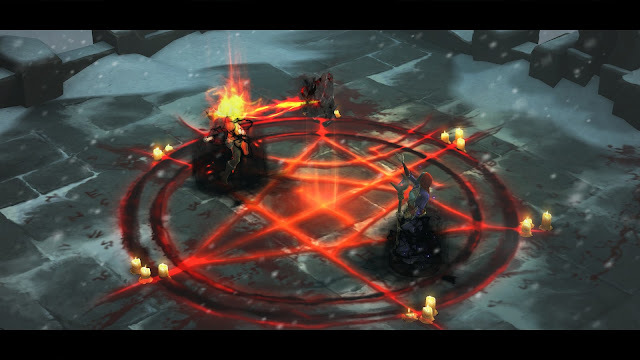 In Diablo 3, there are static pieces (all towns, chokepoints, transitions) and semi-dynamicly generated parts. The basic layout is, for quite many maps, (all outdoor maps) pretty much static. The "chunks" that get put together (i.e. : cathedral levels) or put in to flavour the maps (outdoor areas) are mostly quite big. She's right there.... oh, they didn't think of using this? The designers were not creative at all concerning the setting of the game. Yes, Tristram Cathedral again, deserts again, Mount Areat again. You would think that with a whole book (Book of Cain) of lore written Blizzard would find other places to bring the player to, but apparently not. Though actually that book does not contain any really new places besides heaven, which was swiftly put into the game. There is two problems with the maps. The main one is that the big outdoor maps (especially the desert and the seemingly lakebed one) get boring after a while. There is simply not enough clutter on them to make the trips unique. Just endless, unchanging arid desert floor, with the occasional groups of mobs. Boring. The other problem is related to this, namely that the chunks for the dungeons are mostly too big and too few. There will be many-many "oh, I saw this a dozen times already" moments. This is especially prevalent in the cathedral levels. Now, before I say anything, I only played with the Wizard so far, (with a bit of Monk in the beta,) and as I did miss out a few days, I am only lvl 58 at the time of wiritng, after about almost 70 hours. The classes seem to have their own areas of expertise: barbarian mainly for holding the line, wizard mainly for damage, witch doctor for crowd control or damage, monk for some buffing, some healing , some tanking, demon hunter again for damage. At least at first glance. Wizards can also get some crowd control, damage buffs, and until the nerf, could get ridiculously easy tanking. In inferno difficulty. Ultra-defensive build I used for Izuel after getting two-shot. Unlike Diablo 2, you can use any available skills, you can remap them almost completely freely. This is nice, because you will not be stuck with a build that is not viable for the next boss or the mobs before it. You won't have to reroll, buy remap points or anything like that. This also means that unless you find the specific strategy for a hard boss thought out by Bliz, you might not be able to advance. This is very pronounced in inferno: unless you are using an almost completely defensive build, some classes just cannot advance. Blizzard's weapon of choice. So far they nerfed about half a dozen abilities that they deemed "too powerful" or "broken", down to the "useless" level. No, not in line with the others, just plain useless. What is worse is that they don't seem to nerf the correct abilities or in the correct way, just slashing blindly and wildly. The wizard is a good example for this: there was a build (core: force armor (hits are max 35% hp) + critical mass (-1s cooldown / critical hit) + diamond skin (extra 20k absorb) + 0 vit + 35%/sec hp regen + crit chance items) that was indeed quite good for Inferno. On bosses. You could go out and farm some of the regular content, but unless you had more than enough of the regen and crit chance, which meant permanent diamond skin, you weren't really that infallable. Even with a full "perfect" gear, you could die to champion+rare packs, or had to skip some of the annoying ones. Blizzard nerfed force armor so that the maximum absorbed would be 100% of your hp pool. Still usable in some cases, but in inferno, you had to resort to kiting and hoping you won't run into fast/waller/jailer/etc monsters again. So that build died, and the next one was born: a permanent locking build that worked (in solo) not so well on a few enemies as you couldn't get enough crit hits. It used critical mass, frost nova and whatever the players could use to bring critical chance up and tick damage as many times as possible. Now they nerfed CM so that it won't really trigger in any meaningful way. It basically became useless. Best friend of a Wizard: a giand 2 handed mace. So much for stereotypes! Now I do think Blizzard nerfed the wrong ability in the first case. They should have changed Diamond skin so that it gives extra HP, not absorb. So that with a hard hitter mob, a wizard would still be 3 hits, not 23. Three hits is not much, it is 3 ticks from a DoT, AoE, or 3 fast hero mobs that jumped you. It is really strange that although the official Blizzard statement is that they want to eliminate abilities that are must-have for classes, the over-done nerfing does exactly the opposite, as CM is a very good example: now there is an even smaller pool of potentially viable skills and builds to chose from. Should they continue - and I don't see why they would not - this will leave all classes with nerfed-to-useless, simply useless from beginning, and "I have nothing else to equip" skills. Worst thing is, these changes were all brought on by server side hotfixes, so the popup description of around half a dozen skills is no longer correct. Of course, you would only find out this by frequenting the official forums, but only the US ones. The EU customers are shunned by Blizzard as second class citizens and don't even have a bug report forum. Another great example of Blizzard support and knowhow is experienced by people with conventional hard drives. In an effort to cut loading times to the minimum, Diablo 3 will load assets (effects, sounds, models, etc) on the fly, when they are first used. Unless your storage device has a very low response time, (think SSD or even a pendrive) this will result in stuttering. Unfortunately, most harddisks have a noticeable low response time. This issue was prevalent from the start but only acknowledget by a (US of course) bliz forum poster on the 26th of may. Actually, there is no real single player, it is closer to the truth if we say that your only option is to play the multiplayer alone. The multiplayer aspect is nice, but it is actually missing some key features. Like voice chat or user defined chat channels, guilds and the like. No mail system, no PvP system (though they did promise to be working on it, but this is Blizzard, so half a year if they feel like it). 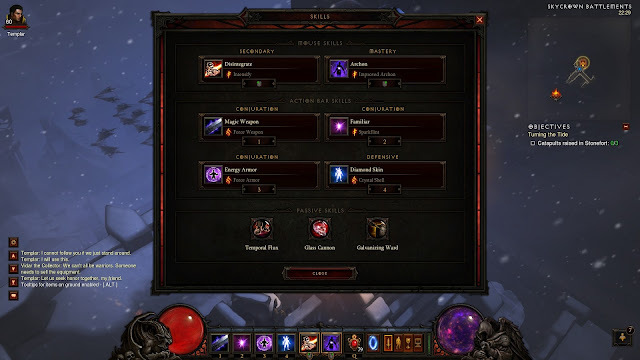 Unlike the Social interface in StarCraft II, the interface in D3 seems to be basic at best. You can't list friends of a friend, you can't even tell the BattleTag of any of them after accepting the friend status unless you are in the menus and not in-game, so you can't help other friends to get connected to them. All in all, only the most vital functions are missing. A very new bug seems to make it impossible to team up with people. For instance, I can team up with one of my firends without a hitch, but not a second one. In the past we played in a 4 player group, and right now we can't even get to three. Note that we can still join public games, the only problem seems to be between me and that second friend. Is bad. Really-really bad. Strength on a wizard-only off-hand weapon? Intelligence for the barbarian? This was mostly OK for Diablo 1 and 2 where the singular resource (mana) was shared, but not here. To top this off, legendaries are very varying in quality. For instance, my last find was - on Inferno, lvl 60, no less - a 2H mage staff that I wouldn't give to anyone, unless they lost their weapons and gold. Even then, farming some gold and buying any basic weapon off AH would be a better choice. Frankly sometimes I feel as if the random drop system would troll me and only give stuff for other classes. So that I'd be pressed to use the AH. 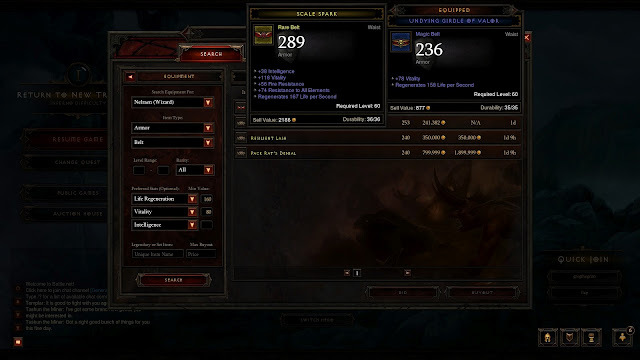 Semi-useless Strength (and loads of Vitality) on a Demon Hunter item: business as usual at Blizzard. Auction house is quite bad right now. I think we can safely say that whoever designed and approved this current version never did use eBay or anything like it. Plus, it seems they optimized it to a fault. And I mean a real fault. Let's start! There are very important basic stats that you can't search for, or you can't search for on every item that may have it. The best example is that you can't search for pure DPS on a weapon. You can search for added arcane, holy and whatever damage (not "added any damage", which, as mob immunity does not exist in Diablo 3, would be an obvious choice) but not DPS that is displayed on the weapons (or the DPS of offhand DPS items). There is a dedicated DPS column in the AH weapons section that you can at least sort by. Unless it is a legendary weapon, in which case it is bugged. You can only search for three wildcarded stats, while rares and legendaries have five and more. 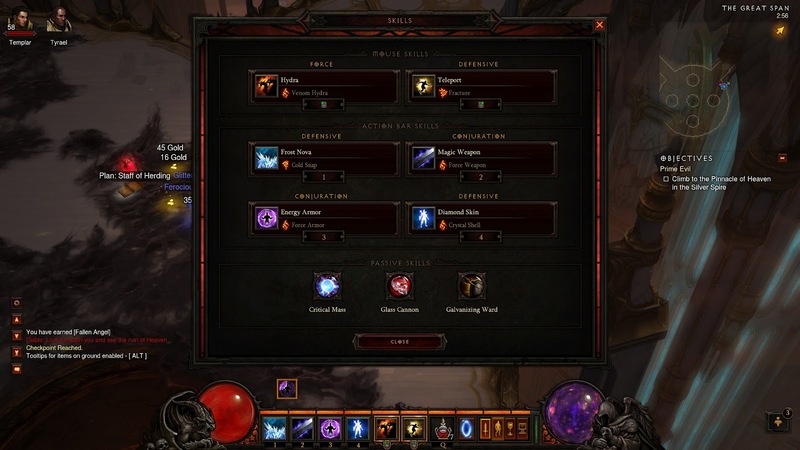 Although there is a popup of your currently equipped item, you don't get the dps/hp/def comparison part. You also have to exit the AH and select a different character if you want to compare it to that of the other characters. Guided by whatever demons they have, Blizzard decided that the gems in the sockets should also contribute to the stats. So if you want a chestplate with 100 int and 3 sockets, you might get one with 0 inherent int and 3 sockets jacked full of +34 int gems. Searching for legendaries is very problematic. Remember: they have static and dymanic bonuses as well, so not all of the same name are equal. You can either search for one given legendary, or you can search for stats. Not both, which would be, again, an obvious feature. You can't exclude stuff from search. There is a maximum buyout filter but not a minimum one. You can't specify a partial name if you want that particular cool looking armor. You also can't only search amongst the items with or without buyout prices. And although you can sort by buyout price, you can't sort by current bid or time remaining. 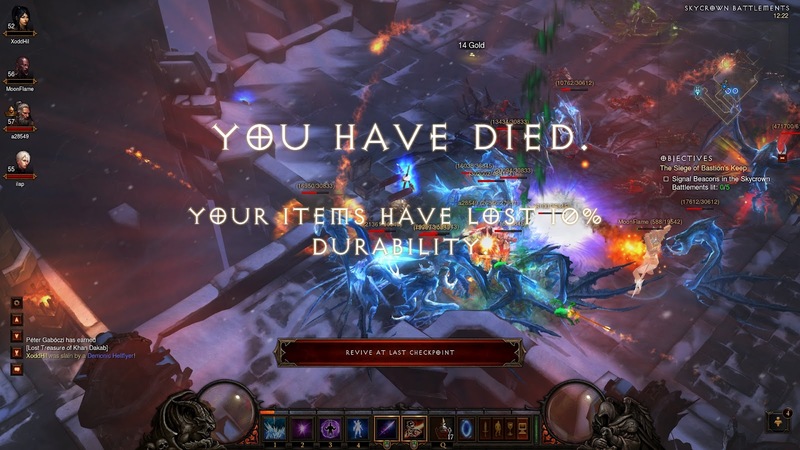 Fun Archon DPS-build: with 30k DPS, Inferno Act 1 with all bosses and blues/yellows is a breeze, except reflect and the usual "leave game" nasties. And even though it is this basic, the AH has very big reliability problems. For days now, the commodity trading has been disabled, and so far there wasn't one week when the AH was working fine during 100% of the game server uptime. Who would want to play multiplayer in a multiplayer game? Nonsense! 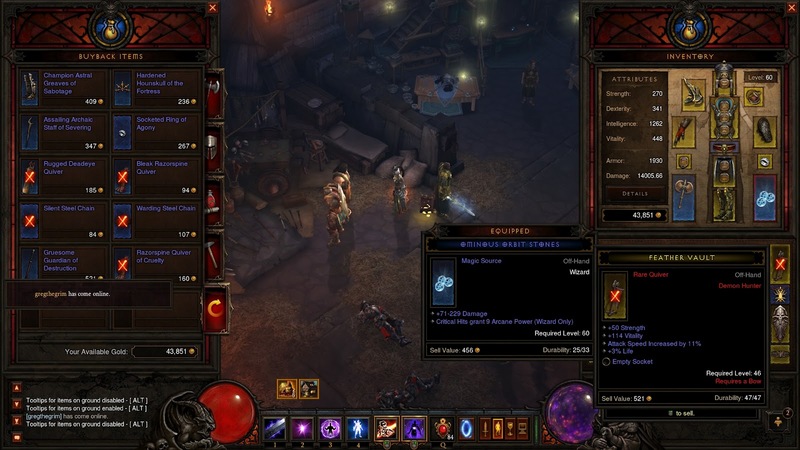 As unlike in Diablo 2, the gems are practically indestructible (you can get them out of sockets) and apart from the very random Blacksmith artisan, nothing eats your items (again, think iron golem in Diablo 2), the market has already started circling the abyss. The best stuff get more and more expensive, while the weapons that cost 100k days before can be had for a paltry 10k. The 80k gems of yesterday are todays 50k candy. (Well, were, commodity market has been disabled.) As you would only ever need one set of the highest gems you use, the gems market will oversaturate and burn. Right now, it is not worth it to use the jeweller to get anything that can drop: it is much, much, much cheaper to jut buy off the AH. Furthermore, a polarization of the market is in the works. The most expensive and most useful items get more and more expensive as more and more gold is funneled into the system, while the cheapest class of items get even more worthless. The middle layer seems to have disappeared for most part, or took the previous place of the expensive items. The AI is really not that good in the game. Pathfinding is quite bad at times, with monsters, followers and sometimes even you getting stuck on everything. As the maps are much less random now, this is quite sad showing from Blizzard. Because the game actually runs on the server, occasionally you might get ported back a couple meters where the local and the server maps (or version of events leading to your position) don't match up perfectly. Sometimes you can kill enemies without being touched thanks to the bad pathfinding AI. The Followers are not quite up to the task either. Take the Templar for instance, who will only heal once every leap year. It seems that his heal is set to activate at a dreadfully low HP, and the detection is also slow. To sum up, in most cases you will either be dead, or have already managed without his bumbling aid. Is mediocre at best. The ending is actually quite bad, in a Matrix 2/3 way. Completely devoid of reason. Who cares if the soulstone, which houses all the prime evils tumbles down from heaven? Certainly not the heroes or the angels, they are perfectly fine with another seuqel or expansion or two. There are no surprises in the story, unless you play the game blind and deaf. Though frankly an engaging and deep story would be a surprise in itself from a hack & slash game. Most of the plot points were already laid bare with the pre-release teaser and trailers. After so much bitching, you would think my conclusion is that Diablo 3 is a horrible game. It is not. Not a horrible, but certainly not anything groundbreaking. Granted, in places, it is not even good, well designed or well thought out.. Some design ideas were very bad, some questionable at least, while the core idea is still moderately good.